Sales of natural snack products have grown by $63 billion in the past 10 years. And in c-stores in particular, those numbers are up 14%, more than any cross-channel competitor, according to data from SPINS, a Chicago-based provider of retail consumer insights and consulting for the natural, organic and specialty products industries. Although natural snacks command only 3% share of c-store dollar sales today, compare that 14% growth to conventional snacks, which increased sales by just 1% last year. Those core snacking products will continue to command high sales volume, sure, but natural and better-for-you products’ 3% share is just the tip of the iceberg—a signal of opportunity, not to mention huge incremental sales growth potential. As c-store operators look for ways to take advantage of better-for-you and natural products’ untapped potential, the best growth opportunities may be healthy snack subcategories that are underdeveloped in c-stores but gaining momentum. Dried fruit, for example, offers tremendous growth potential for c-stores. This naturally healthy and delicious treat represents a $15.9 million product segment in c-stores for the year ending April 16, 2017. Compare that to grocery and mass retailers’ $285.9 million dollar sales of dried-fruit snacks during that time frame. In other categories such as meat snacks, convenience-channel retail dollars are equal to grocery and mass retailers. Dried-fruit snacks offer a ton of growth potential in trendy flavors. Dried-fruit products including mango, apple, and mixed berries have a higher growth rate than the subcategory overall, according to SPINS. The top selling product, mango, grew by 46% vs. the prior year. According to Nielsen xAOC sales data for grocery and mass retailers, tropical dried-fruit snacks are up 10.5% vs. last year. Merchandising dried-fruit snacks, as with any better-for-you or natural product, requires a bit of finesse and promotional strategy. Industry experts like Kimberly Kawa, senior nutrition researcher at SPINS, suggest placement of healthy snacks on endcap displays. “[With] wellness bars, trail mixes, jerky/trail-mix combos, granola bars, RTD smoothies,” she says when asked about merchandising suggestions. “Products that focus on portability, grab-n-go aspects, with a healthier-choice vibe”. Kawa also recommends adding signage that helps promote trendy, clean-label attributes, along with a range of other highly diverse natural, organic and healthy products. 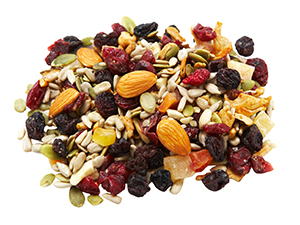 C-stores may traditionally be known for indulgent snacks, but consumer demand for all-natural, healthy snacks is changing the way retailers think about their snack assortments. Stocking better-for-you snacks that sell well in grocery and mass retailers is a great way for c-stores to change consumer perceptions and pick up incremental snack sales.